It was amazing how quickly our climate changed in just a few hours. We left dry and dusty Cody and drove along Highway 20 westwards over the 9,500ft Sylvan Pass which quickly drops to the average 7,500ft elevation of Yellowstone. As soon as we began climbing, the arid country became green pine covered mountains with steep gorges and mountain rivers twisting along with the road. Within two hours we arrived on a pebble beach on the northern shores of Yellowstone Lake in chilling temperatures, 20mph winds and driving rain. 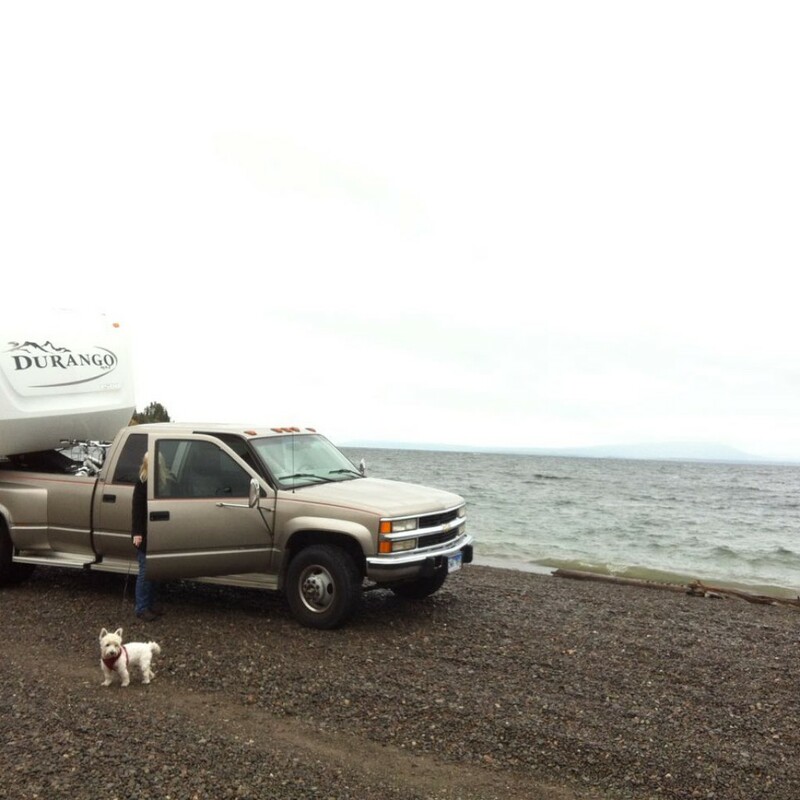 Freshwater waves crashed ashore and as we were allowed to drive to the lake’s beach – we drove our 13,000lb 45ft long rig right next to the water’s edge. Compared to hot and dry conditions in Cody on the same morning, we felt like we had landed on another planet! Yellowstone National Park suddenly presented us with a special and vastly different environment compared to the rest of the world. Beached on the shores of freshwater Yellowstone Lake. 20mph winds at 7,500ft with small waves crashing. It was such a shock of a change! A vast and preserved park which has stood untouched by development, the high elevated freshwater lake, the stormy cold weather obscuring the horizons of the lake making it appear as though it was endless, and we were parked on a beach! This is a unique place and it is no wonder it has such fame and reputation. As we progressed on the road further into the park we remained within view of this pristine lake. Behind trees and over hills we soon began to see clouds of steam rising from volcanic vents. The effect accentuated by the misty and cold air. It doesn’t seem real and it’s like nothing else that we’ve ever experienced. All this within the first few minutes of passing the Yellowstone east entrance. Yellowstone is a busy place to visit and we were lucky to be there in early September when it’s quieter than the summer period. Even so, traffic can suddenly stop in the middle of a forest road when someone spots a wild elk, bison, antelope or spectacular scenery. Often one car will stop, then another will slow to see what the others are looking at, then more will stop, and soon there is a traffic jam of cars with people scrambling with SLR cameras for a perfect wildlife shot. At first it’s a little annoying, but really it’s great to see people appreciating natural things so passionately. There are many camping grounds in Yosemite and they are well spread over several large villages, each village is about an hour apart. It’s that big! All villages have a supply store, restaurant, gas station, accommodation lodge, information centre, and a campground or RV campground. Everything is extremely well catered, and even cell phone and wireless internet is available in most areas of this huge wilderness. We stayed in Grant Village, which is located at the south-western shore of Yellowstone Lake. 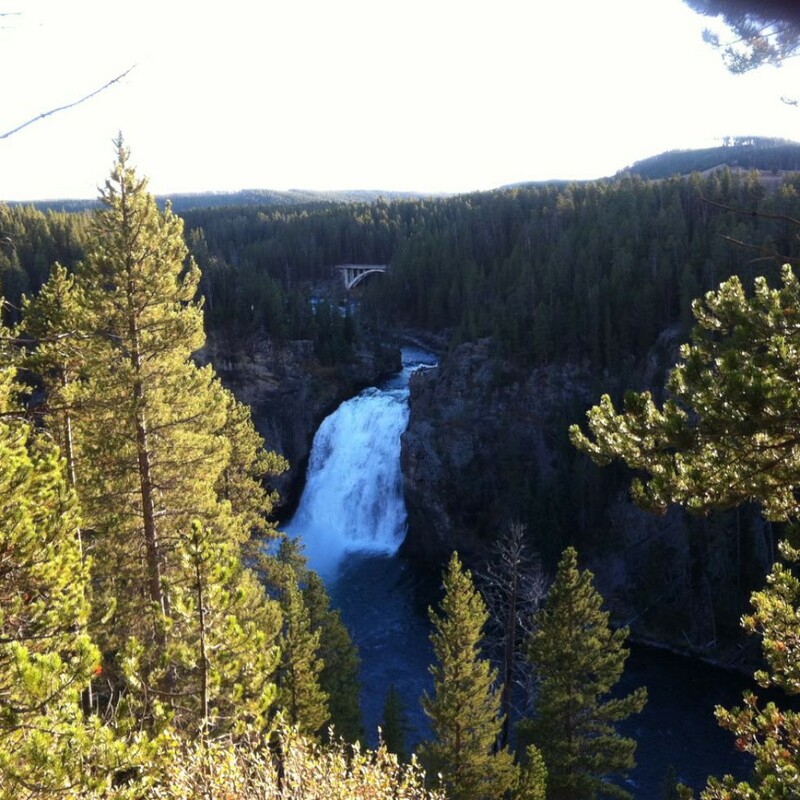 It’s not possible to be central in any part of Yellowstone – unless you have one specific activity during your visit. This was our first visit, so we were happy to call it a reconnaissance visit and chose to find our way around and randomly pick highlights along the way. No matter which area you choose to stay, there are many attractions within part day, half day, or a full day trip. We arrived at Grant Village checkin office about 10 minutes after the 11am checkin time and were surprised to find a queue of about ten other campers and RV’s parked in a waiting line. 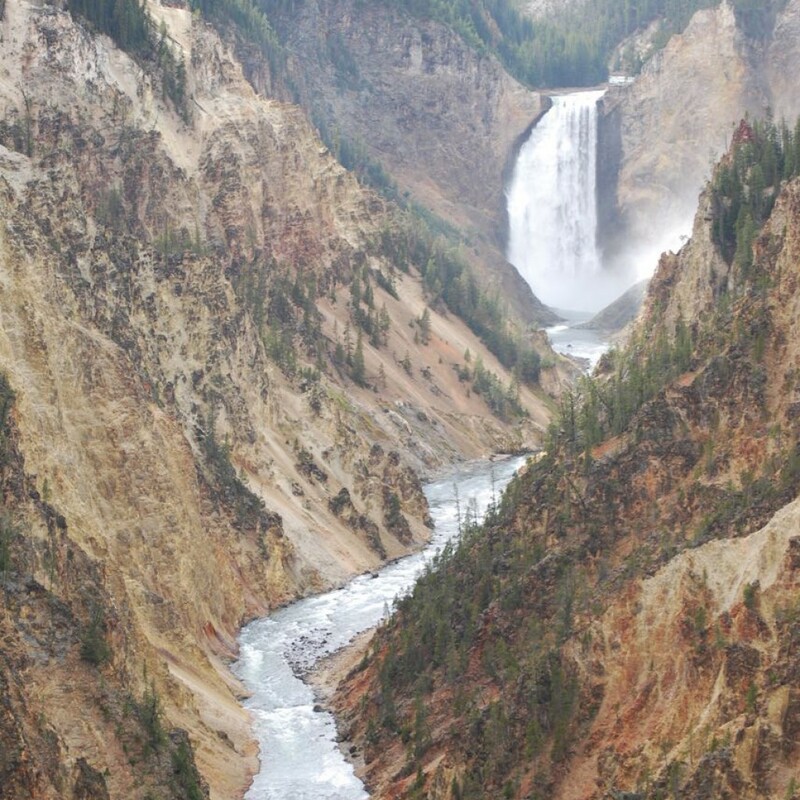 There was a queue of people at the office, standing in the rain, and each were happy and enthusiastic just to be in Yellowstone even though it was cold and uncomfortable. After checkin, we were allocated a space in the Group C section of Grant Village Campground. Spaces for RV’s are very small. In fact they are really designed to park your car and walk through to a tent space, but they have converted the parking space into a place to locate your RV. It was lucky that we had a 27ft fifthwheel. 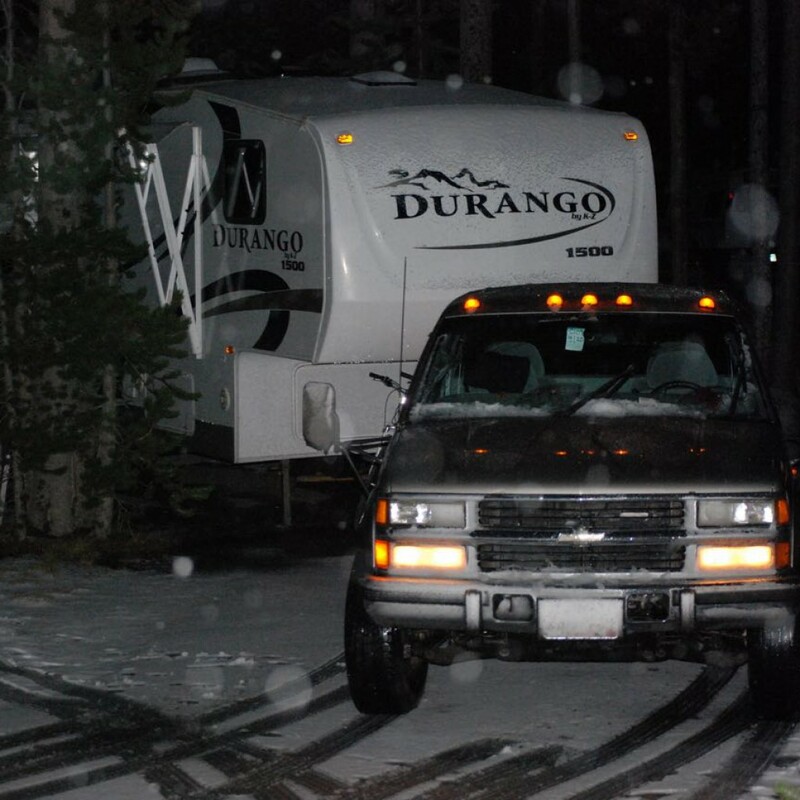 There were some 35 footers there but I suggest checking with the park office before going in with a bigger motorhome. It was fairly obvious the park management prioritized the environment over comfortable RV parking. And this is for good reason. It is one of the most pristine parks in the world. There is no water, electricity, or sewer connection for motorhomes, RVs, and travel trailers, and if you want luxuries, you need to run a generator for 110v electricity, unless you have enough solar panels. Generators are permitted to run between 8am and 8pm, but we thought this was a little too excessive and ran ours for an hour here and there and only between 9am and 6pm when most campers left on day trips throughout the park. First snow event of our trip. Only light snow but exciting for someone who hasn’t experienced falling snow. We think it would have been better if RV campers, especially those with generators, were parked well away from tent campers. We could sense the disappointment and frustration from tent campers who were there for the full camping experience being intimidated with loud generators. In the 5 days we stayed at Grant Village, we ventured out to several highlights. Old Faithful was easy to pick and while there we visited the information centre to seek advice on other view points. 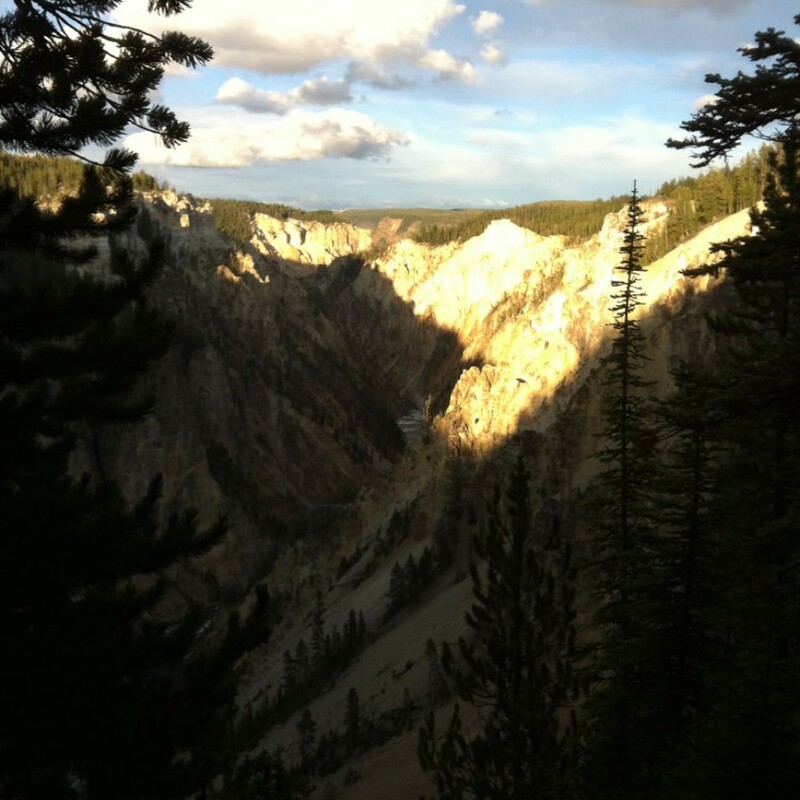 We didn’t plan too much in advance for the visit to Yellowstone, we still work while traveling, so we have to balance work and travel experiences carefully. Because we are fulltime travelers we have the comfort of being able to either extend, or return another time, and call this visit a planning trip for next time. We found many highlights just by touring the roadways and there were many serendipities along the way. There is a simple road layout of a figure eight pattern and all points of interest are accessed from this course. 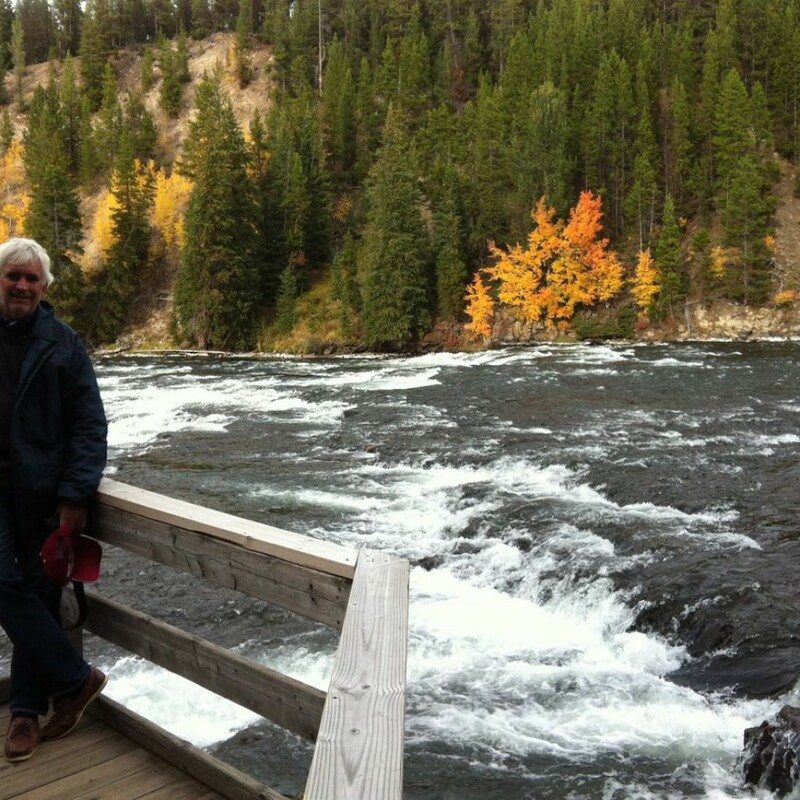 Whilst at Old Faithful we came upon the Old Faithful Inn – an historic hotel complex built in 1904. The hotel was built from local pine logs and stones and it is worth visiting to sit by the fireplace in the lobby and sip hot chocolate or any other drink you choose. 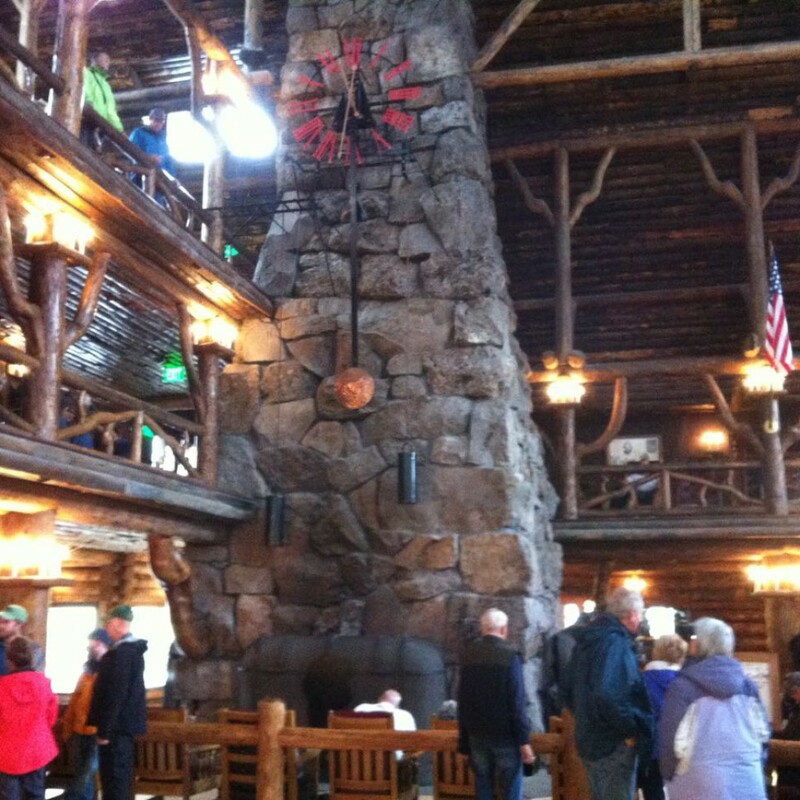 Fireplace and clock – Old Faithful Inn. Firehole Canyon drive was next in our unplanned tour for the day, and with the rain still falling, it was sensational to see flooding creeks and waterfalls. A lone bison stood by the roadway, only 12 feet or so from the truck. This was one critter that didn’t stop traffic and attract crowds, he was hidden behind thick bushes. Other wildlife on this tour included countless squirrels, elk, and during one of the traffic jams in the wilderness, we think we could see a lone black bear in the distance in tall grass. It wasn’t obvious what it was, but it was causing quite the spectacle for the crowd that stopped to see what everyone else was stopping for! Those with high powered scopes and cameras would have been best entertained. 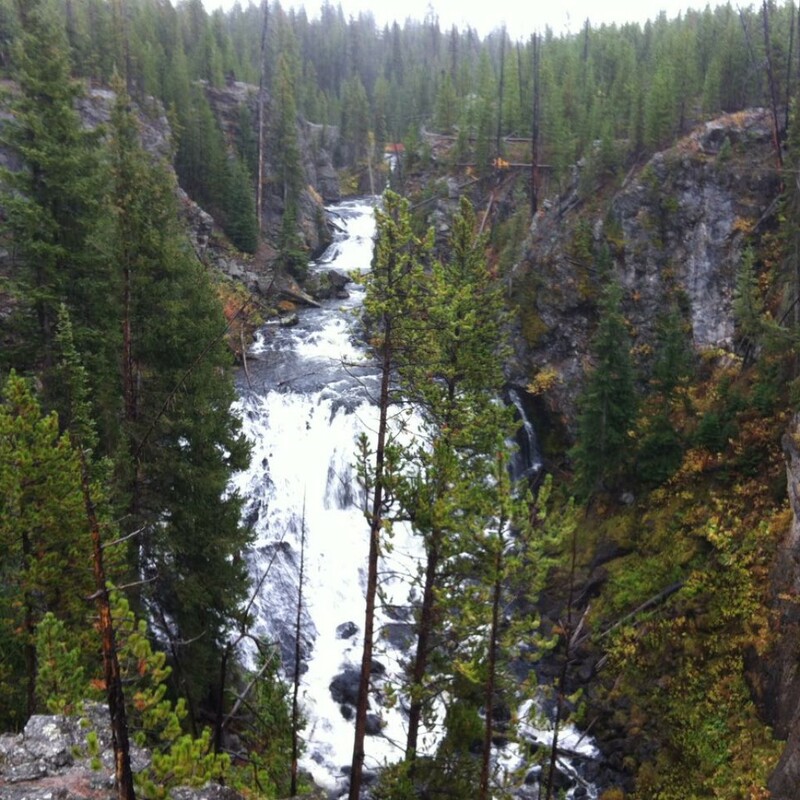 Firehole Canyon falls in rain. Yellowstone NP. Other days were taken with walks through geyser fields. 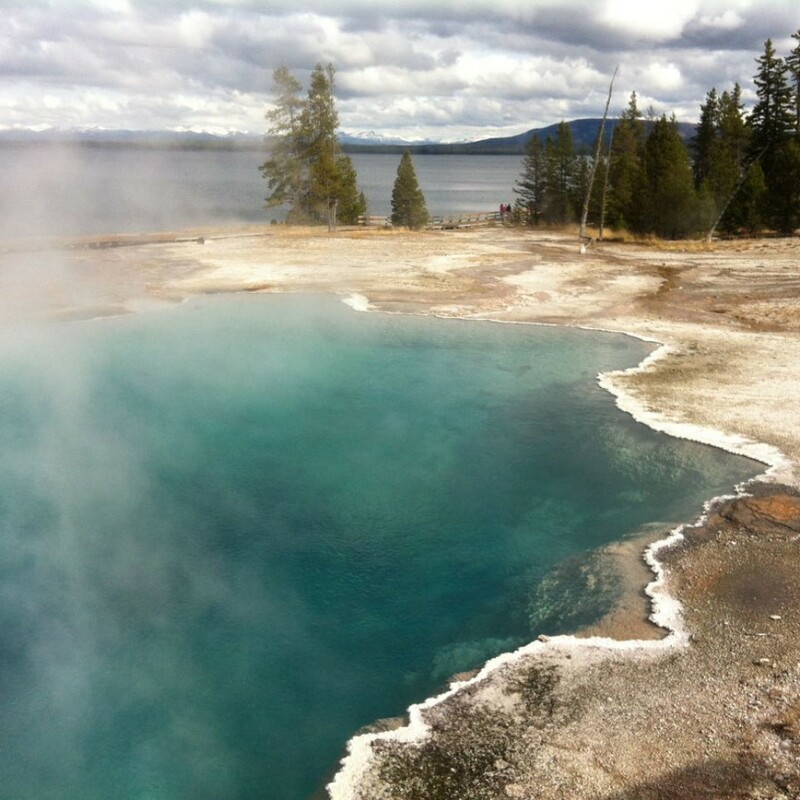 Geysers take many forms, colors, and shapes. 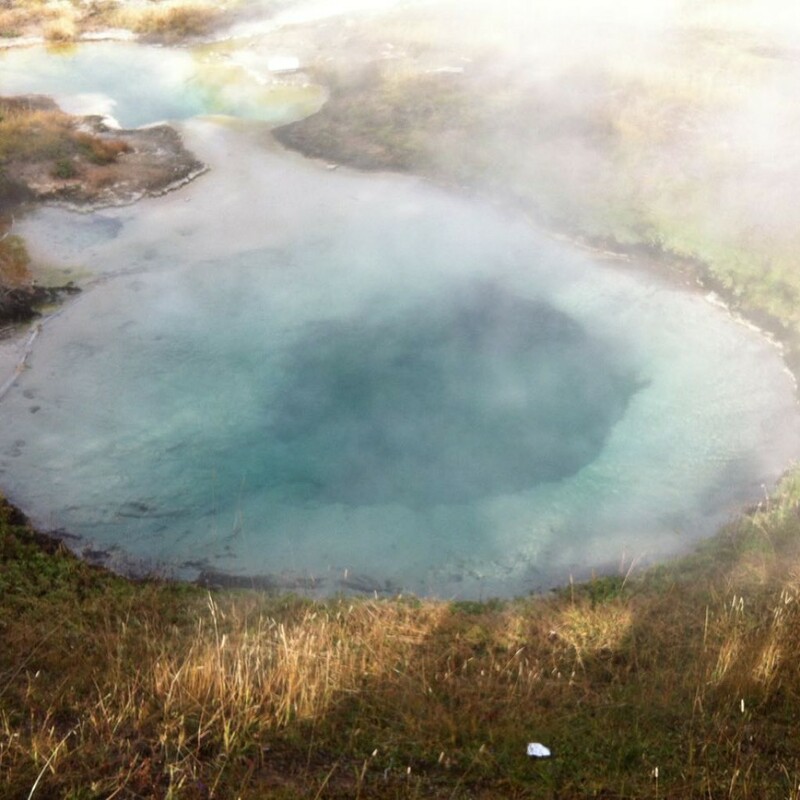 Some are just tiny pits of boiling pink mud, colorful pools of clear water and brightly colored mineral deposits with more spectacular steam vents sending plumes of white steam and mist high into the air. It was great to be given the opportunity to be so close to such power and force, within a foot or two in many cases. We recommend at least five days to visit the area. Book well ahead. We booked three months in advance and had only one campsite to select. Our campsite closed on the day we left for the winter months. The plumbing to the amenities blocks were to be flushed with compressed air to remove all water. This prevents pipelines bursting in freezing weather. 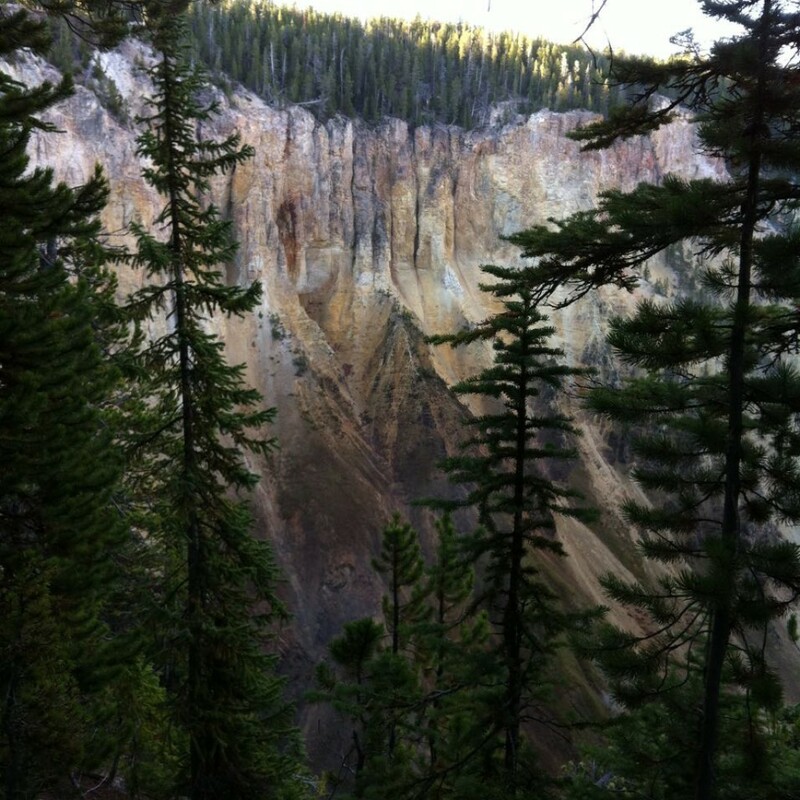 Steep cliffs, Yellowstone River canyon. 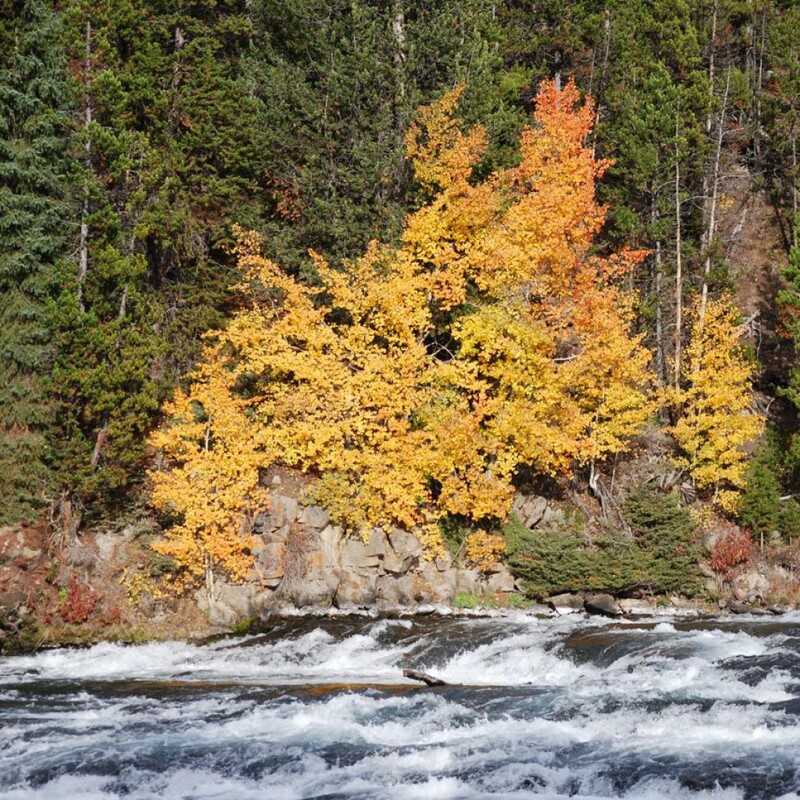 Yellow colored stone in the Grand Canyon of Yellowstone NP. Grasses and plants thrive on the edges of extreme conditions. Soon they will be covered in snow and ice. 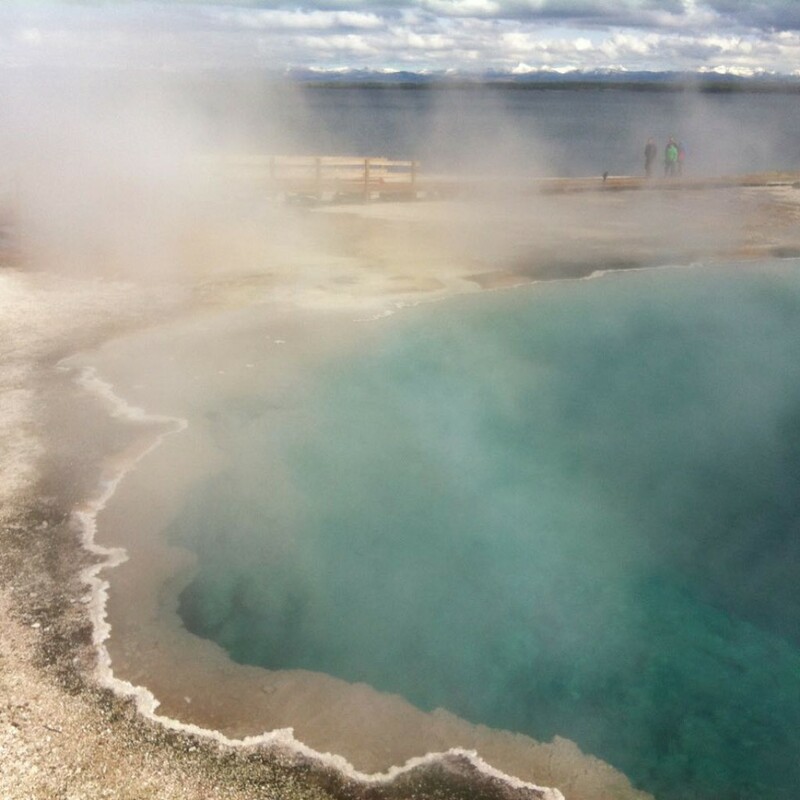 Animals are known to visit these hot springs to absorb the warmth in the icy winters. Water rises to the surface at near boiling point. Minerals crystalize on the edges over time. Old Faithful Inn. Built entirely of forest logs in 1904. 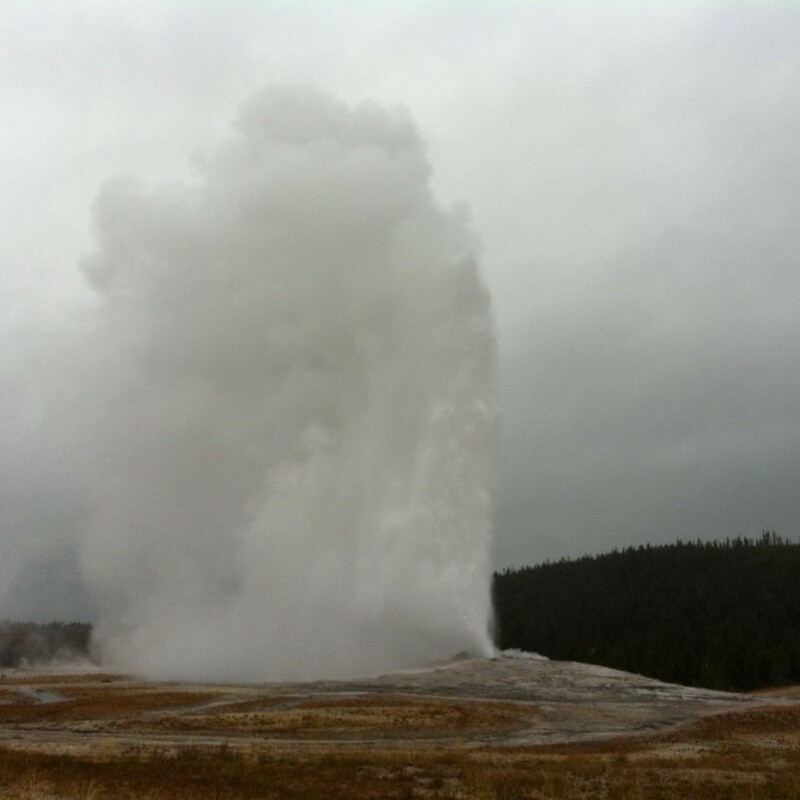 Old Faithful has a ten minute window. A sign board in the visitors’ center displays the next session. 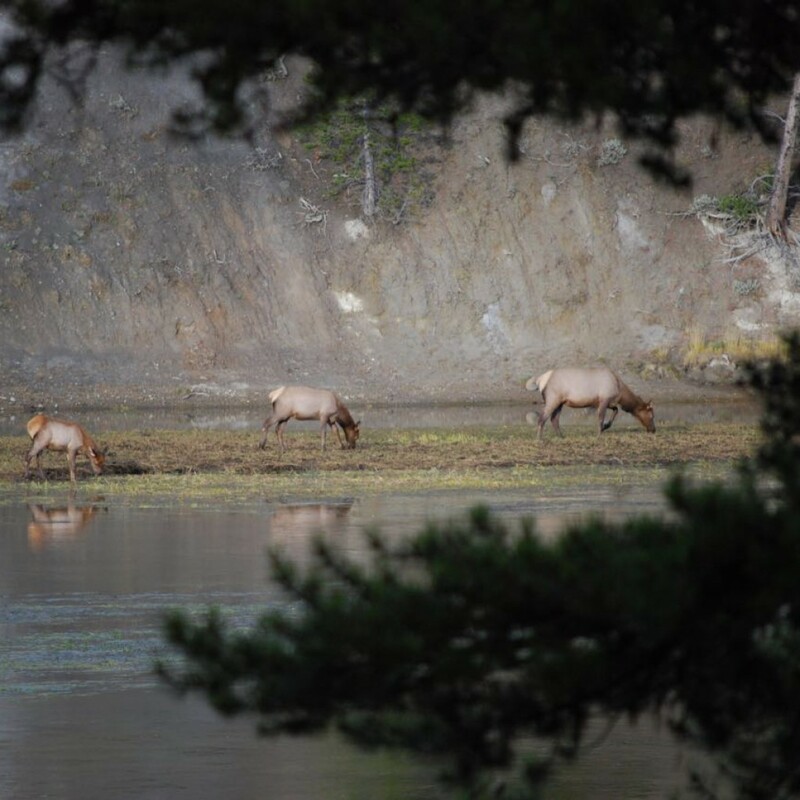 Antelope feeding in shallows, Yellowstone River. 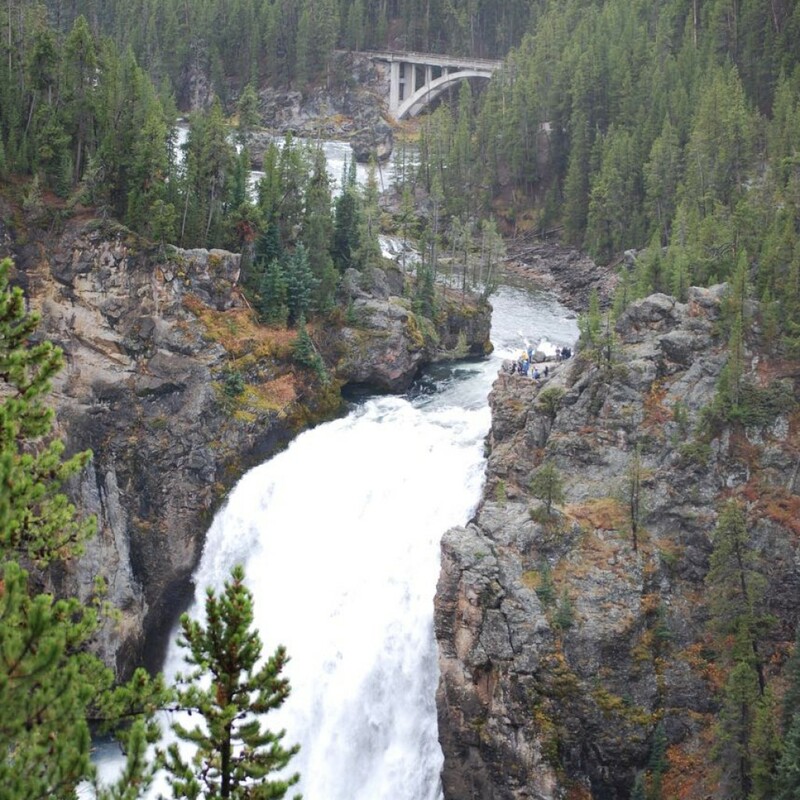 Upper Falls of Yellowstone River. Landscape photos of other places always feel a bit unreal to me even though i KNOW they are accurate! 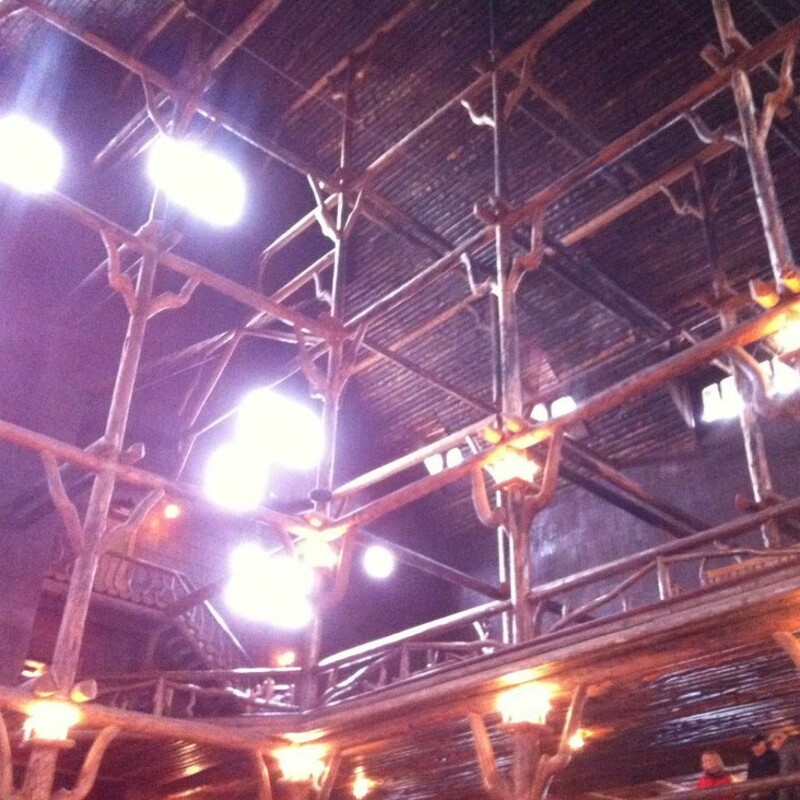 Also like Old Faithful Inn. Built entirely of forest logs in 1904. Why is there not more of this sort of thing?